I found about the place thanks to Terresa. She teaches cooking classes about organic vegetarian food in Paris. In fact she is living this topic in the city, writing a blog about it, guides artisan food tours and natural wine tastings, organizes private dinners and there seems to be no limit to her energy. I got lucky to attend her Organic Vegetarian class at Cook'n with class school in the morning of that day. It turned out that in 2001 and 2002 Terresa worked at the kitchen of l'Osteria with Toni Vianello, its Venetian owner and chef. From Terresa's web-site I came to read Recreating the finest risotto of my life article about him. "Toni’s risotto broke all the rules" - it was saying - "He would cook the rice to a certain stage, without ever resorting to the usual constant-stirring-and-adding-the-broth-bit-by-bit". I was getting more and more engaged, because that's exactly how I cook my risotto. "Toni, you see, insisted that it was the mantecare - a vigorous, final beating-in of butter - that was the essential part of risotto-making". I had to go there. It was 4.30 p.m. when I was out of the class and it was my last and only evening in Paris. There was no way to get into the 32 seat l'Osteria which seemed so famous and perhaps busy, I thought to myself. I gave them a call and there was obviously no reply as it already closed for lunch but didn't yet open for dinner. At 7 p.m. I called again (without much hope) and asked whether I still could make a reservation for that night, making my best effort to speak proper French. "Oui, madame" - maitre'd replied. It was so unexpected that I instantly said "This is great!" in English. It felt like magic. 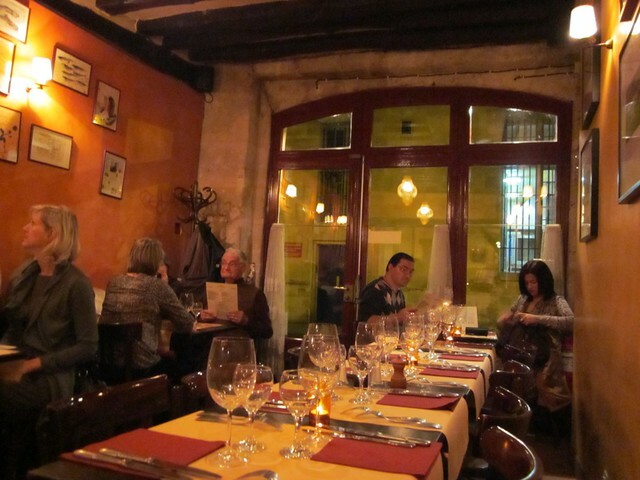 L'Osteria looked exactly how many of the best Paris restaurants - tiny entrance, the sign is almost not visible. I'd never notice it if I wasn't searching for it on purpose. When we came in at 8.30 p.m. it was half full. Maitre'd welcomed and seated us. My dear friend and I could hardly stop talking. We haven't seen each other for almost a year since I left France, but we made an effort to focus on the menu - we were really hungry. It was one page and offered different kinds of pasta, some pizzas and finally risotto which I was looking for. We decided on risotto aux coquille saint-jacques (scallops) and picked caponata as a starter. We felt that less than a bottle of wine wouldn't do for such an evening and maitre'd suggested us a light white Italian Nova Serra, which we absolutely loved. Caponata arrived just in time to save me from starting to snack the delicious baguette standing right in front if me. The roasted eggplants and zucchini tasted fabulous to me at that moment. 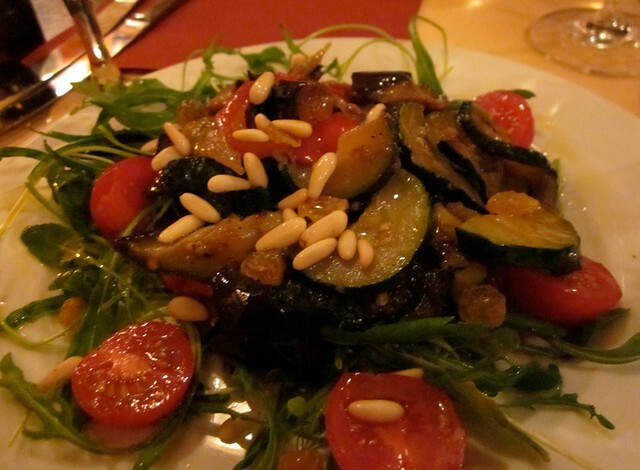 They were topped with toasted pine nuts and raisins and served over fresh rocket in balsamic dressing. It disappeared in a few minutes and then the risotto came. Risotto was generously served in deep hot plates. It was ivory-white and welcoming and had this amazing creamy texture, where you can still feel the rice holding its shape. It was full of flavor, deep and mild at the same time. The pieces of saint-jacques were delicious-tender. It completely blew my mind away and I ate way more than I'd normally be able to. When we realized our wine was gone and looked around l'Osteria was empty. It was around midnight and we were the last guests. The hospitable maitre'd was preparing to close the restaurant. We paid and left grateful, amazed and a bit sad. That was the end of our little time together, of my little happy day in Paris. When will I get to see it again? I enjoyed the post and the good pictures, you make us feel as being in that warm little restaurant.